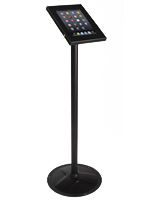 Need a durable tablet display that secures its contents with a lock? 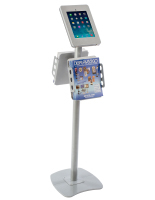 These iPad kiosks are made of sturdy materials and are great for high traffic environments like retail stores, trade shows, universities and service organizations. They allow customers to browse pictures, videos and apps that may lead them to making a purchase. 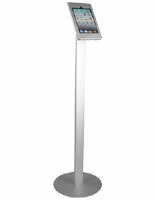 Alternatively, in non-commercial environments, users can learn, create, answer surveys and fill out forms with these interactive fixtures. Each stand is made of steel, aluminum or acrylic and features a locking case that ensures valuable devices will be safe. 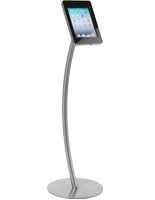 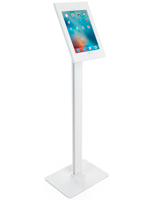 iPad kiosks like these have a simple, yet stylish design that will complement any décor. 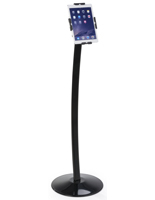 Each holder features a black, white, silver or clear finish that will add a modern touch to any display. 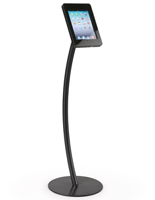 In addition, these can have a straight or curved construction that will remain stable with their weighted base. 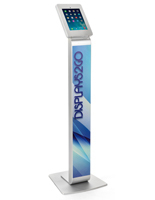 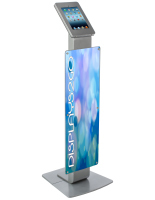 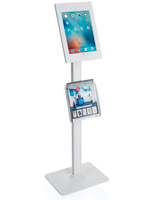 Each iPad kiosk, or standing touchscreen enclosure, has a unique design for meeting any advertising or merchandising need. 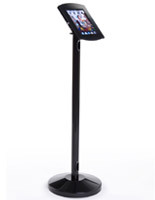 What features can be included with these secure tablet stands? 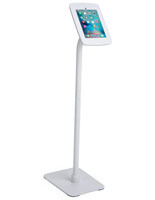 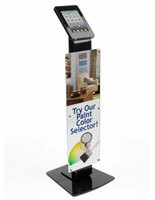 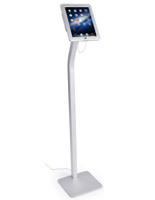 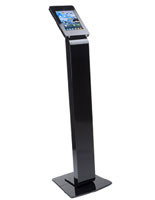 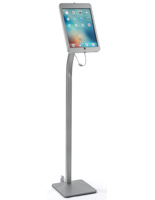 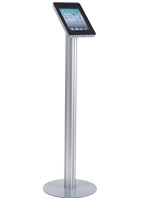 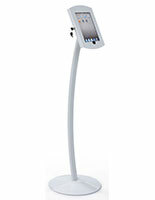 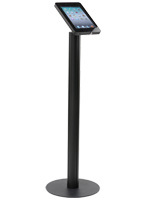 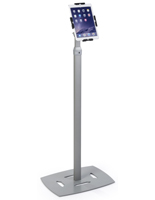 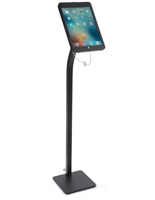 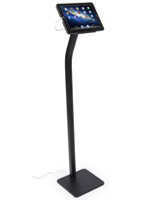 iPad kiosks with an additional mount are excellent for giving out extra information or displaying a banner. 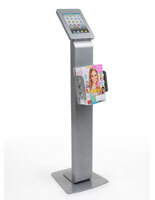 Some models feature a literature holder that can be used for selling magazines in retail environments or for giving away catalogs and brochures at events like trade shows. 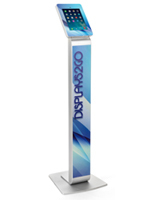 Other designs feature a poster frame for showcasing graphics behind an acrylic panel. 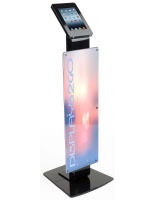 This will draw in passersby with a vibrant logo or give them additional information. 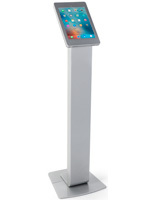 Locking kiosks for touchscreens can have an adjustable enclosure for facing any direction. 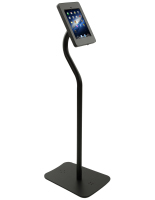 These can often rotate, allowing them to switch between portrait and landscape orientations for accommodating any app, video or slideshow. 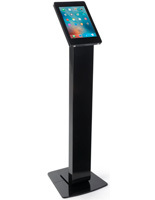 Tilting enclosures will be able to adapt to any user’s height, making them ideal for any age. 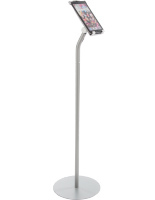 Other fixtures have an adjustable height support that allows for further freedom. 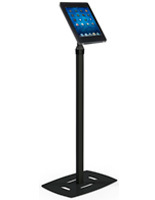 Mounts with a cable management system keep cords out of sight and keep areas organized. 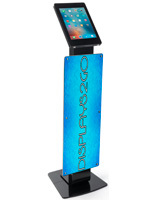 Tablets operating for more than a few hours will need to be plugged in to stay powered. 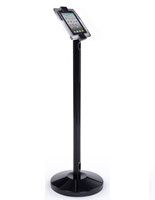 These holders have a hollow construction for hiding pesky cables to prevent customers from tripping and falling in retail stores and at events. 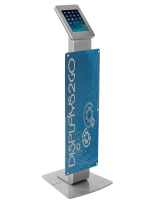 While kiosks like these have a lighter support, their aluminum and steel fabrication ensures that they are no less durable. 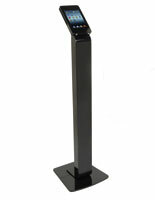 Some models feature an area for housing a power strip for extra convenience. 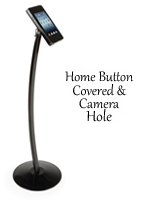 Each trade show mount for has a different home button option. 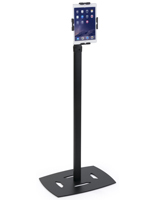 Some hide it, allowing storeowners to control what apps customers can access, while others show it so that users may navigate wherever they please. 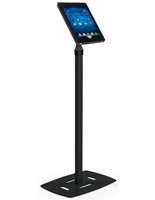 In addition, they may have an adjustable cover than can either conceal or expose it. 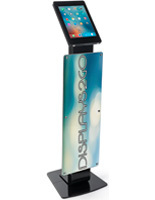 These locking device enclosures for retail stores have different methods of securing their contents. 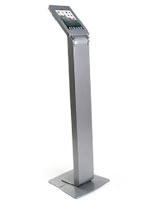 Most fixtures lock with any included key on the side, bottom or back of the case. 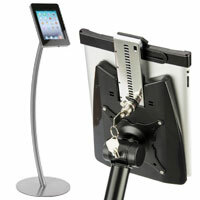 Alternatively, they use a Kensington lock kit that attaches directly to the device. 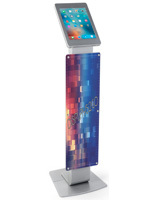 This uses a combination or a key and is wrapped around a permanent object like a table. Additionally, each touchscreen display supports different generations from the Apple® or Samsung brand. 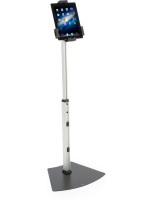 When purchasing a locking stand, make sure that it can accommodate the correct handheld computer.